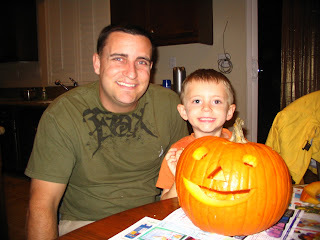 Dave and I decided that Caiden was old enough this year to carve his own pumpkin. That means, draw it, scoop it out and carve it. 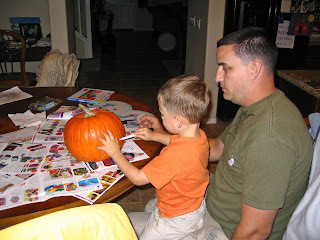 Well, seeing as Dave has been working for the past 8 days straight there wasn't much time to buy and carve pumpkins before Halloween. Dave got off work the day before Halloween, so after work and school we met up to go buy pumpkins. 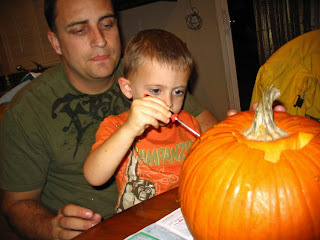 Caiden then drew his design on his pumpkin. 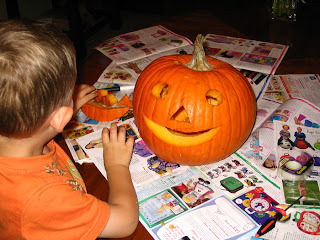 He already had outlined that he wanted to make a "happy pumpkin". He drew round eyes, and a round nose (which Dave changed to a triangle) and a big smile. Look how well he draws! 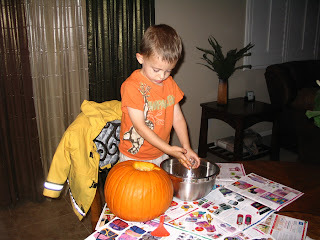 What a sweet kid...making a happy pumpkin. I like his happy pumpkin. 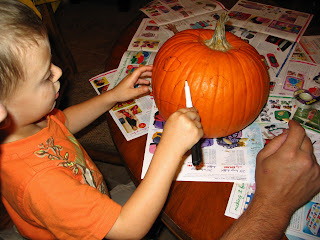 Makes sense to me for a good first carving.